OAK BROOK, Ill., Feb. 21, 2019 /PRNewswire/ -- Parents, do not be surprised if a savvy kid holds on to a lost tooth until market conditions improve. The Tooth Fairy's purse strings appear to be tighter than a year ago with the average monetary payout down by 43 cents. According to the just-released Original Tooth Fairy Poll®, sponsored by Delta Dental, the Tooth Fairy's average cash gift declined to $3.70 for a lost tooth. Not all parents say the Tooth Fairy is following the national average. In homes that the Tooth Fairy visits, close to 2 in 5 parents (37 percent) share they give their child at least $5.00 or more. Also, a first lost tooth continues to impress. Parents recognize this monumental tooth with an average of $4.96, representing $1.26 above the $3.70 average for subsequent teeth lost. 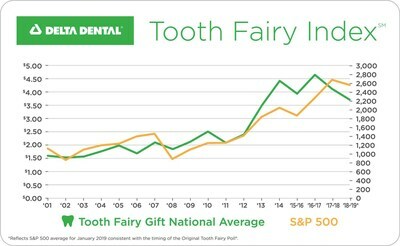 Delta Dental has been gauging the Tooth Fairy's U.S. annual giving trends for more than two decades. The newly disclosed value of a lost tooth may be slipping but is significantly greater than the 1998 national average of $1.30, which equates to about $2.00 today with inflation. The Original Tooth Fairy Poll has typically served as a good indicator of the economy's overall direction, tracking with the movement of Standard & Poor's 500 Index (S&P 500) for 14 of the past 17 years. A year ago, a single lost tooth was valued at $4.13 and dropped to $3.70 in this year's survey, down 10 percent. Over the same time period, the S&P 500 also saw a decline and decreased by 3 percent. Joy: The Tooth Fairy gives kids something to be excited about, according to more than half of parents (56 percent). Bedtime: Children go to bed early when leaving out a tooth say 30 percent of parents. Savers: Children choose to save their Tooth Fairy earnings say nearly half of parents (48 percent). 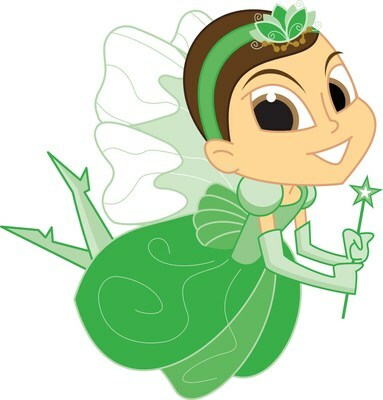 Oral health: More than one-third of parents (34 percent) believe the Tooth Fairy instills good oral health habits. "While our Original Tooth Fairy Poll is rooted in fun, it is also interesting to see how parents are using visits from the Tooth Fairy as a learning tool in their home," said Jennifer Elliott, chief marketing officer for Delta Dental Plans Association. "Parents share that the Tooth Fairy is delivering so much more than a tangible gift for a lost tooth, such as teaching our next generation about proper oral health habits and personal financial responsibility in a memorable way." The Original Tooth Fairy Poll was conducted between December 31, 2018, and January 13, 2019, among a nationally representative sample of 1,058 parents of children ages 6-12. The margin of error is +/- 3 percent. The S&P 500 stood at 2,687 on December 28, 2017, and decreased to 2,596 by January 11, 2019, down 3 percent. For more information about the Delta Dental-sponsored survey, Tooth Fairy trivia, and oral health tips for infants to pre-teen, visit Original Tooth Fairy Poll. Delta Dental Plans Association, based in Oak Brook, Illinois, is the not-for-profit national association of the 39 independent Delta Dental companies. Through these companies, Delta Dental is the nation's largest provider of dental insurance, covering more than 78 million Americans, and offering the country's largest dental network with approximately 156,000 participating dentists. In 2017, Delta Dental companies provided more than $61 million in direct and in-kind community outreach support to improve the oral health of adults, children and infants in local communities across the country. For more information, visit: deltadental.com.